Since I'm posting cake pictures I thought I'd add in a few of my past favorites. 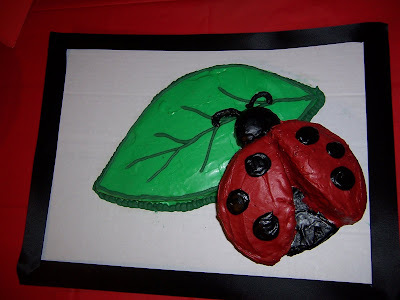 This was a ladybug cake I made for our cute friend Emma's birthday party a few years ago. 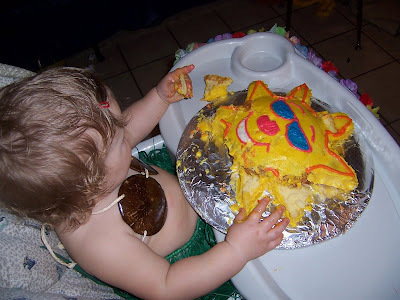 This was the little cake Lila got to tear into for her first birthday party. 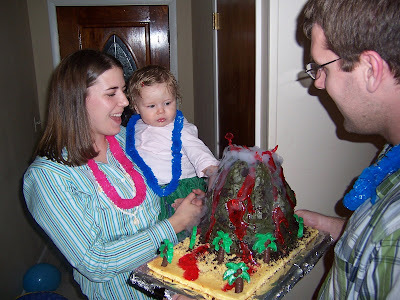 Here is our infamous Volcano cake for Lila's first birthday Luau. And it tasted as good as it looked! oh my gosh EMILY, i'm so going to steal that volcano idea and i love the touch of the coconut bra and grass skirt from the other picture. sooo soo sooo cute! YOU ARE AMAZING! Lady Bug one is my fav, but Lila's come's in close second. The spider looks awesome. I can't believe it was picked last. I guess people were afraid to eat it. You should have seen the baseball cake i made for Cameron's birthday...looked pretty silly. I knew I wanted you to make it, but it's kinda hard to ship a cake across the country.